Many people don't see the Russians, formarly the USSR as been technolgical pinoers but they'd be very wrong. They had the first manned space flight and the first space station, but one of there lesser known acheviments was the modern Infantry Fighting Vehicle. 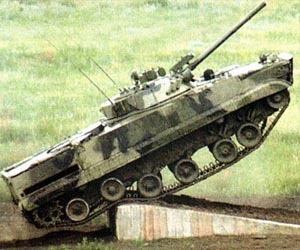 The first BMP made by the Russians was the BMP-1 IFV which appeared in the 60s. Never before had a APC had such fighting capabilities. The BMP had a massive fire power with a 73mm cannon and Malutka anit tank missles. This capabiltiy allowed it to engage any tanks of the time. The BMP could carry 8 soilders in the rear whos outwards facing seats and holes in the side meant that they could fire there personal weapons as well. It had two large rear doors and 4 hatches which allowed rapid and safe troop deployment. The profile of the BMP was low which meant it was a harder target that the large main battle tanks. Its off road cabilities were good to with the ability of water crossings with out perperation of the vehicle. The slanted front armour meant that it could withstand small calibure gun shots as well. Never before had an APC been seen with this type and range of features and seat the bench mark for the rest of the APC produced by the western world. The Russians knew they were on to a winning forumla and made sure they could upgrade it, a new 30mm automatic cannon and new 9M113 anti-armor missile and more armour, but the decreased carrying capacity from 8 to 7. More changes were made still and the way the troops disimbarking was changed making it safer, also more shooting holes were created. Also a 7.62mm machine gun and 2 9M133 Kornet launchers were mounted in the turret which meant that the turret was now manless. 2 PKT machine guns were mounted on the front and could be operated by the troops the BMP was carrying. This new configuration was the BMP-3. In 1982 new turrets replaced the older versions, this new turret had 2A70 100mm thin-walled, threaded cannon and 2A72 30mm automatic cannon and a laser range finder. A modern 2K23 fire control system is installed which has a ballistic compter and 1K12-2 gun sight which included infra red capabilities. TKN-3s stabalized gun sights were installed wide spread which were cheaper than the better TKN-4s. The BMP-3 had a lower track pressure and was equiped with a propellor which allowed it better speed on water and manovability than the track driven water borne tanks. The BMP-3 was the Russians cutting edge techonolgy and was meant for a large scale hi tec war with NATO and on the break up of the Soviet Union many BMP-3s were put into long term storage because of the increased price after the USSR broke up. The BMP-3 would have never seen combat because it was not used in Chechen campagin because it was not deemed a high tec conflict for its use. The BMP-3 widy exported to the Arabs UAE, Kuwait, Cyprus, the Greeks, South Korea, Sri Lanka Ukraine, Azerbaijan and Kazakhstan. The BMP-3 has yet again seen many upgrades and new roles made for it but the main vehicle remains. It is on of the most heavily armoured APCs in the world but it has its floors. The rear engine, poor engine air filter for desert use and weak catapillar wheels as well as troubles with the auto loader. The BMP-3 certainly is an attractive alternative for rich countries which want to possess a modern army. However nothing indicates that it will be as popular as BMP-1 or 2.